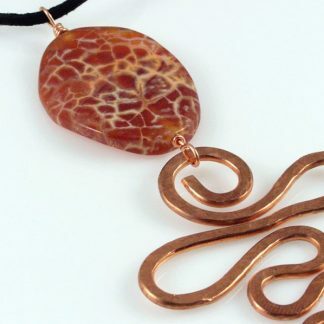 Show off this beautiful Copper Serpent Pendant on any occasion. 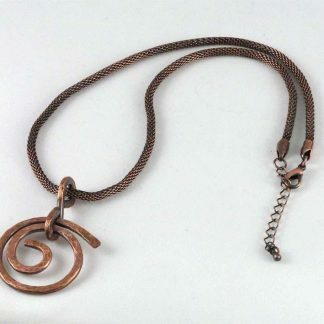 It was designed with a Fossil Coral bead (1 by 3/4 inch) and pure thick Copper wire, hand hammered and slightly oxidized, forming a stylized, graceful, flowing Serpent symbol. Measures 3-3/4 inches in all (Copper Snake is approx. 2 x 2-1/2 inches), and comes ready to wear with a double silk cord in shades of yellow and orange with a copper clasp. The snake or Serpent is one of the oldest and most complex of symbols. Its representations are paradoxical: part protective, part destructive; a source of strength and power, yet also potentially dangerous. In many cultures, the image of a snake represents the universal life force and sometimes the creator itself. The shedding of a snake’s skin highlights the notion of life, death and rebirth. 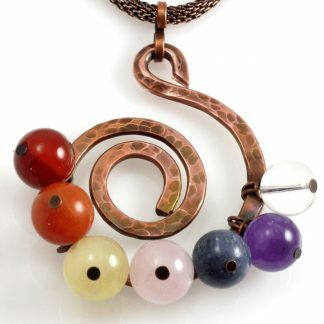 Its reptile nature also represents its earthy quality and potential for healing. In Egypt, an upright hooded cobra was a powerful protective symbol. It formed the uraeus of diadem of the pharaohs, representing their royal power and ability to strike down any enemies. The caduceus, the staff of Hermes, which is entwined with snakes, is still used as a symbol of medicine and healing today. In India, cobras are viewed as guardians, with a seven-hooded cobra often depicted shielding Vishnu and Buddha. In African and Native American legends, snakes are often depicted as ancestor figures.